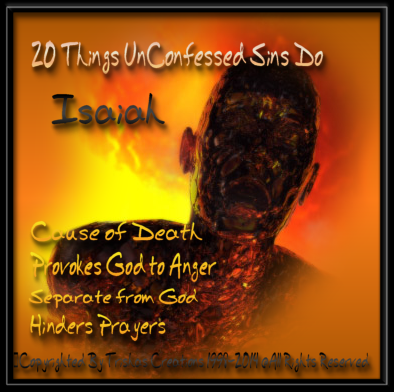 "20 Things UnConfessed Sins Do"
Welcome to "20 Things UnConfessed Sins Do"
Many people think just because they believe in Jesus Christ means that they automatically get into Heaven. This is not the way it goes, in order to get to Heaven and be with Jesus and our Loved ones, we have to have the right kind of heart. Our Hearts cannot be full of envy, hate, malice, rudeness, cursing, lying, backstabbing, bitterness etc. Out hearts are to be full of Love and Compassion, we have to have the agape type Love, we cannot focus on ourselves and our desires, we have to have compassion for other's. We also, have to confess our sins everyday, not just when we want to or think about it. Jesus doesn't care how many times a day, because if He would come back at the time, you didn't confess your sins, what do you think would happen, especially if your heart is full of hate and malice for someone. Please when you read these you can look them up in your Bible, to verify the scriptures.